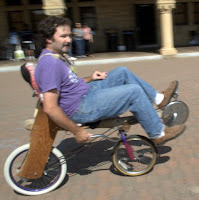 The Stanford ESP Blog: Crazy Bikes! Students in the class learned about how to make very unique bikes. After an explanation of different design strategies and construction techniques (cardboard designs, wood designs), the students worked in teams to design their own bikes. These designs were reviewed at the end with ergonomics, integrity, and uniqueness in mind. Check out more classes here! Dang that guy is CRAZY! Does he really ride that bike places?